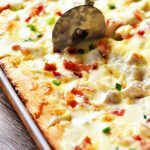 Chicken Taco Pizza will steal the dinner time show! 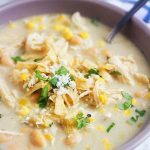 Loaded with seasoned chicken, refried beans, cheese and more. This pizza is always a hit whenever I serve it! 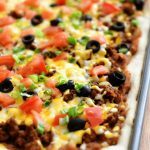 I posted my famous Taco Pizza about 6 years ago and to this day is still a super popular recipe here on the blog. For you readers, and for my family. It’s one of those recipes I keep in my treasured recipe box where only the best of the best recipes go. I have tweaked this recipe since. On the original recipe I used a Pillsbury pizza dough crust. I haven’t used that in years. I either use my favorite homemade pizza dough (which is so easy and spectacular) or I use a store-bought flatbread pizza crust. It’s a win win either way. And a delicious win at that! The other week I was craving my Taco Pizza and had all the ingredients except for the ground beef. I was in no mood to run to the store so I made this Chicken Taco Pizza version instead. It turned out just as yummy, if not a little yummier. If you guys are in the mood for a dang good pizza then please make this one. Stat! Prepare pizza dough according to directions. Then let pizza dough rest at least 10 minutes, covered. Then press dough out onto a large pizza pan. If using store bought flat bread pizza crust, remove from package and place on a pizza stone or large pizza pan. Cook chicken cubes in a large non-stick skillet, over medium-high heat, until no longer pink in center. About 10 minutes. 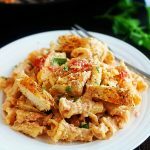 Stir in taco seasoning and ranch dressing to chicken (no need for any water) Continue to stir and cook another 5 to 8 minutes. Remove skillet from heat (and turn off heat) and let chicken mixture rest. Pour refried beans into a microwavable-safe bowl. Microwave for 1 minute. Stir well and then spread beans evenly over the top of the pizza crust. Top with the cooked chicken mixture, sprinkle with cheese and then add the tomatoes, black olives and green onion. Place pizza in oven and bake 12 to 15 minutes, or until cheese is melted. Carefully remove hot pizza from oven. Let rest 5 minutes then slice and serve. Enjoy! Store any leftovers in an air-tight container in the refrigerator for up to 2 days. It is a very delicious dish, and the procedure you have given for making it, is very much easy, I definitely try to make it on my own, thanks for sharing such recipes like that.